The co-writer of a musical about a lesbian couple that tries to go to their high school prom invited Mike Pence to come and see the show. The Prom is about a girl who tries to take her girlfriend with her to prom, and the small town school cancels prom to keep her from going. Co-creator Chad Beguelin said that the play is about fictional characters but was inspired by real incidents of queer kids being kept out of their school’s proms. And Beguelin wants Pence to see the show. “I think you really need to come and see The Prom, and also, we set it in Indiana because of you,” Beguelin said. The Prom made its world premier in Atlanta, Georgia, in 2016. In November, it opened on Broadway. 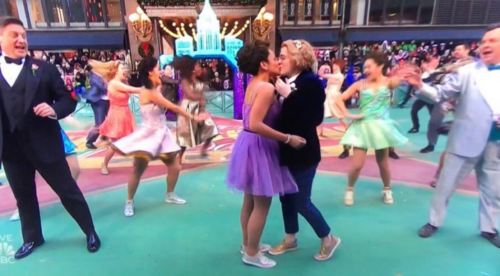 Beguelin said that it’s the first Broadway show centered on a lesbian couple. Pence’s office has not said whether he will be attending the show, but since he got publicly chastised by the cast of Hamilton the last time he took in a Broadway show, the chances are slim.